Earlier today, I read Sunny Side Up, the new graphic novel by the brother and sister team behind the very popular Babymouse series. This one, a semi-autographical story based on their childhood, is for a reader a bit older – I would recommend it to kids ages 10 and over. As I read, I kept thinking of how much those Raina Telgemeier fans are going to love this book! It’s the natural next book for the readers of Smile and Victoria Jamieson’s Roller Girl. 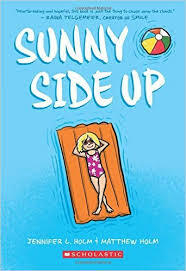 Sunny Side Up takes place in 1976, when ten-year-old Sunny spends the summer with her grandfather in Florida while her parents devote time to Dale, Sunny’s older brother’s who is making increasingly risky decisions. Naturally, when Sunny hears Florida, she thinks Disney World , but her grandfather lives in a retirement community and his idea of a day out is a trip to the grocery store. Luckily for Sunny, there’s Buzz, the groundskeeper’s son, who introduces her to the world of superheroes and comic books. Interspersed with Sunny’s and Buzz’s adventures are flashbacks to the situation that led to Sunny’s summer in Florida. While these are sobering moments, Sunny Side Up is an upbeat (even “sunny”) story of a young girl who cares about her family – and ultimately gets to visit Disney World! I’m about the same age at Jennifer Holm so the references to products and events from 1976 made this an especially fun read. Sunny’s bedroom includes a copy of Tiger Beat magazine and pictures of Dorothy Hamill! I read another book today – but it was much shorter, in fact only 32 pages with minimal text. But I loved it. 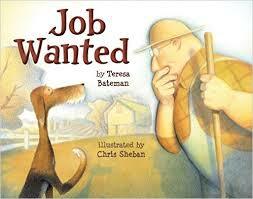 Job Wanted by Teresa Bateman is one of those picture books that is made for reading aloud to a group of kids – which means I’ll be reading it again very soon. Of course, the dog (who is expressive and lovable) finds creative ways to prove his value and there is a satisfying ending. The illustrator, Chris Sheban, clearly had some fun with Bateman’s story. The farmer wears glasses, but his eyes can’t be seen through them. Is he pointing out that the farmer can’t see the great dog standing right in front of him? By the last page, it’s clear the farmer gets it! A librarian from Ohio (who works with my sister) sent me this awesome diagram – which conveys an entirely recognizable situation. I’ve traveled to places carrying more books than I could possibly read – with the knowledge that I will purchase books during the trip. Of course, I’ve tried e-readers, but something is lost with the words on the screen. It feels like I’m reading one long e-mail. 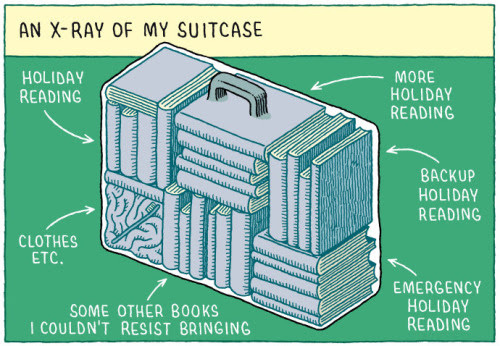 Like many readers, I carry my heavy tote bag from one place to another and keep my eyes open for the next bookstore!